He will always be "Mr. Cub," the most popular player in the history of the Windy City franchise. His sunny personality is legend, as is his refrain on a sunny day: "Let's play two!" The first black player on the Cubs, Banks came up as a shortstop, where he won consecutive MVP awards (1958-59), but actually played more games at first base. Like his contemporary, Hank Aaron, Banks didn't look like a typical slugger. He was slim, with powerful thighs, and he held his bat high, wiggling it nervously while waiting for the pitch. The look was deceiving at first, but 512 career homers later, no one questioned Banks' power hitting ability. 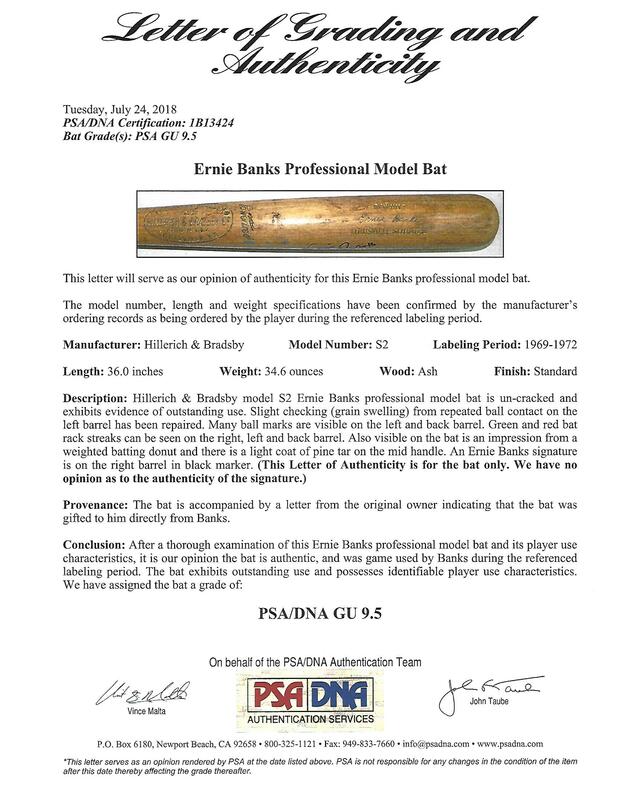 Dating from the tail end of his storied career, this Hillerich & Bradsby (S2) Ernie Banks professional model bat was manufactured in 1969-72 period. It is un-cracked and shows evidence of outstanding use. The barrel is covered with ball marks and ball stitch impressions. Slight checking from repeated ball contact on the left barrel has been repaired. Also visible on the bat are green and red bat rack streaks on the right, left and back barrel. The upper handle shows an impression of a weighted batting donut and light coat of pine tar on the mid-handle. The model number (S2) is stamped into the knob. 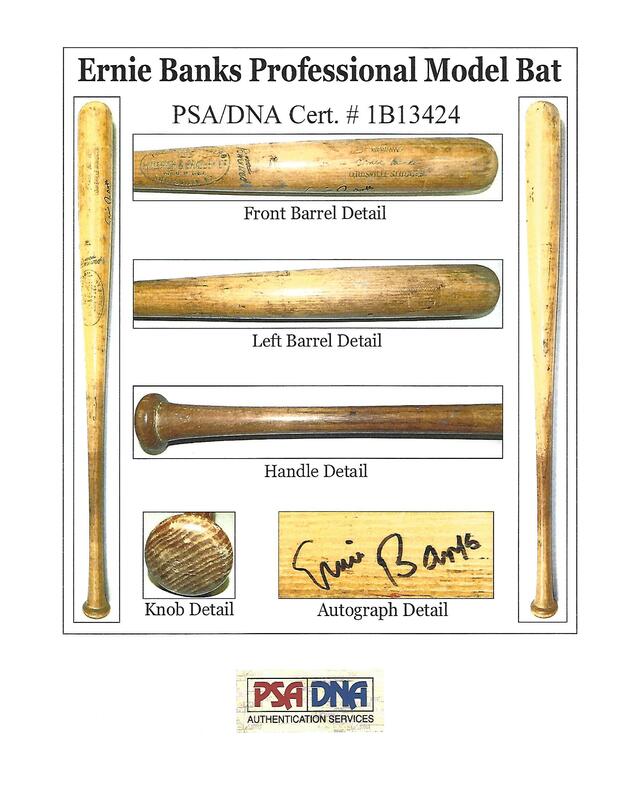 Ernie Banks' signature appears on the right barrel in black marker. Length: 36 inches. Weight: 34.6 ounces. 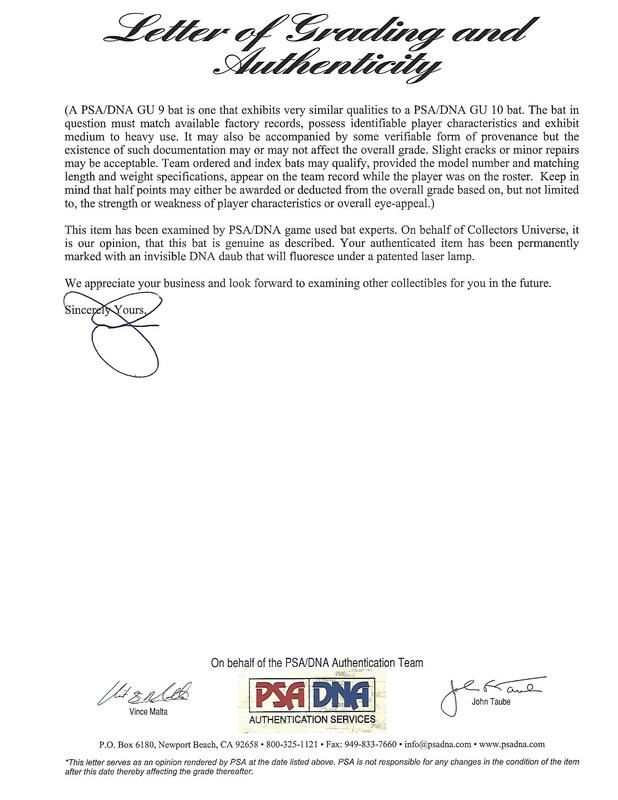 LOA from John Taube of PSA/DNA (Graded GU 9.5). Letter of provenance describes how previous owner acquired it.